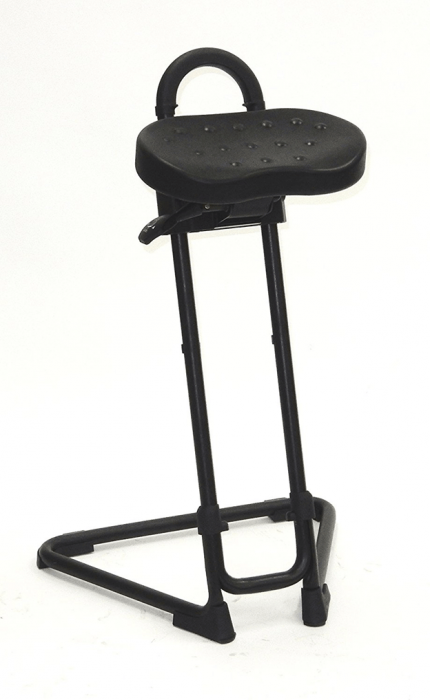 ShopSol sit stand stools are ideal for preventing fatigue in garages, workshops, factories and more. Sit stand stools provide relief from standing while providing support to remain in an upright position. Base shape allows stable positioning up close to work stations and production lines. Ergonomic, padded polyurethane seat swivels in either direction and tilts forward up to 20 degrees. Seat height is adjustable from 22-3/4 - 32-3/4 to suit workers of almost any size. Matte black tubular steel base includes four strong nylon anti-slip glides to provide stability on most flooring.